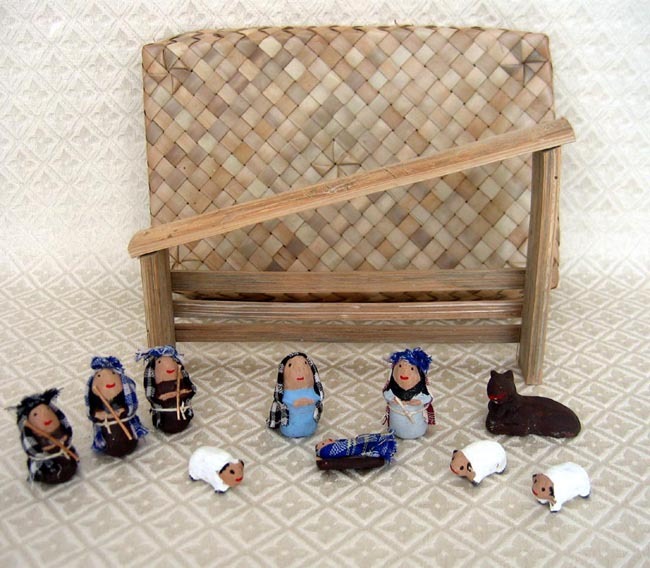 This Nativity was crafted by the poorest of poor women with HIV–AIDS in Cambodia. The set is made from natural materials found on the ground. The box is hand-woven palm leaves. The clay figures are hand-formed, sun-dried, and hand-painted. The stable measures 8.25 inches wide by 5.5 inches high. Place of Peace: A refuge in Samroueng Tong district, Kompong Speu Province, providing homes and support for at least 16 families living with HIV–AIDS. When both parents in a family die, the surviving children will be permanently placed (if parents desired) in the Garden of Joy. Another family living with HIV–AIDS will move into the vacated home. Garden of Joy: A residential program in Samroueng Tong district, Kompong Speu Province, providing a home and support for up to 40 children who will be orphaned when parents die at the Place of Peace. In some cases, children orphaned apart from Place of Peace will also be accepted. Community Development: Basic training and support for village development committees in Samroueng Tong District, Kompong Speu Province, including project activity in the areas of health, literacy, agriculture and home care for families living with HIV–AIDS.